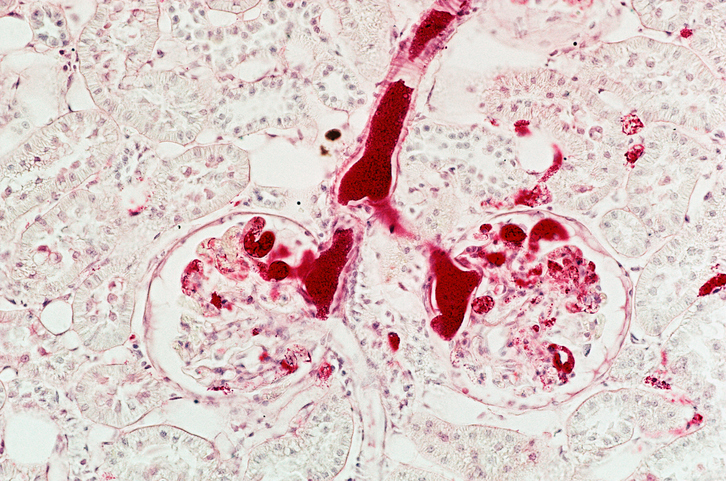 Researchers assigned 38 patients with metastatic renal cell carcinoma to receive pegilodecakin plus nivolumab or pembrolizumab. Previous studies have demonstrated that pegilodecakin, a pegylated human interleukin-10 that stimulates the cytotoxicity and proliferation of CD8+ T-cells, produces a partial response rate of 25% among patients with heavily pretreated mRCC. In this non-randomized phase 1b study (ClinicalTrials.gov Identifier: NCT02009449), researchers assigned 38 patients with mRCC to receive pegilodecakin 10 or 20 µg/kg plus nivolumab 3 mg/kg or pembrolizumab 2 mg/kg. Study participants had a median of 1 previous treatment, including at least 1 vascular endothelial growth factor receptor (VEGFR) tyrosine kinase inhibitor (TKI). At the time of analysis there were 34 evaluable patients. After a median follow-up of 13.8 months, median progression-free survival (PFS) was 16.7 months among patients who received pegilodecakin plus nivolumab and PFS was not evaluable among patients who received pembrolizumab and pegilodecakin. The 1-year overall survival (OS) rate was 89% overall. Fourteen (41%) and 3 (9%) patients achieved partial response and complete response, respectively. Fifteen patients (44%) had stable disease, and a tumor reduction exceeding 30% was reported in 8 of these patients. Pegilodecakin had a large effect in increasing T-cell clones in the blood, which correlated with tumor response. Grade 3 to 4 adverse effects among patients treated with pegilodecakin 20 µg/kg included anemia, thrombocytopenia, hypertriglyceridemia, reversible cytokine release syndrome with splenomegaly, and increased immune-mediated red blood cell phagocytosis. Patients who received a lower dose of 10 µg/kg did not report grade 3 to 4 anemia or thrombocytopenia. Tannir NM, Naing A, Infante JR, et al. Pegilodecakin with nivolumab (nivo) or pembrolizumab (pembro) in patients (pts) with metastatic renal cell carcinoma (RCC). Oral presentation at: 2018 ASCO Annual Meeting; June 1-5, 2018; Chicago, IL.